Looking for a bold pattern to make a strong statement? 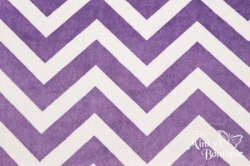 Minky Chevrons pack the perfect punch! A soft balance of two-color Chevrons, these geometrics will make an impact in any room, big or small.